Well, thanks to all who have sent get well wishes my way...I'm feeling better every day. Colds are the worst!! Anyway, as I said before, I've been working on some things even while I was sick. One of them being this fun little Recipe Card File. 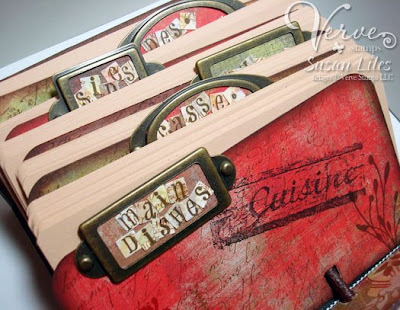 Jen and I have been talking for a while now about doing another alterable project from Glue Art and Paper Studio (they have a lot of fun things coming down the pike!). We agreed to wait until after the holidays and scheduled it for this week. I needed this desperately, so I made it for myself in the style that I would someday like my kitchen to reflect...French, Chocolate, Coffee somethin' or other!! I love how it turned out! It's a Standard Size Crafter's Card File that comes in just the unfinished wood and you get to complete it any way you want! For this one, I chose to use all Scarlet's Letter papers from Basic Grey, some old SU! 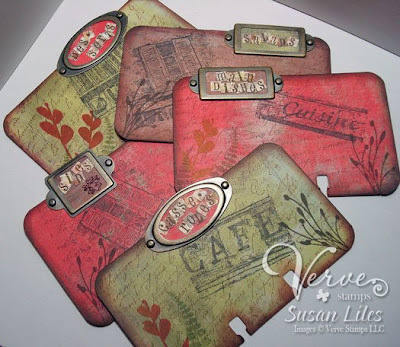 stamp sets, some more classic sets from Verve stamps (so cool! ), and a few other choice "goodies". I simply painted only the edges that were to show with brown (why waste time and paint the whole thing?) and covered the rest with paper. I adhered it with Mod Podge and then applied another coat on top for extra durability. 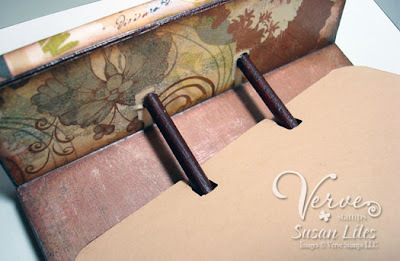 I may even go back and Mod Podge the divider cards. I thought I'd never use my 1/4" Square Punch from SU!, but I did here for each of the letters on the dividers. I really wanted to go to Michael's and get these cool Making Memories letter stickers, but was stuck at home with no vehicle--so I saved a little money and did it the "old fashioned way" by stamping my own. I probably would have run out of the "Vanna" letters anyway (R, S, T, L, N, E). It never fails. Enabler Alert: Just a coincidence that Glue Art and Paper Studio is having a sale right now! Selected items are 30% off and you get a free card file with any $75 purchase!! Check out their new online store HERE!! SUSIE Q-TIP: I was lucky enough to be chatting on the phone with my friend, Sheila as I was making this (Imagine that. Some days I talk so much, I have to ground myself from the phone the next day! Anybody wanna call me now? ), so really this is her tip. I had counted up and stamped all my letters randomly that I needed for the file tabs. I was about to punch them all out when she suggested I run the stamped piece of cardstock "whole" through my Xyron "X" sticker maker first and then punch them out. GENIUS!! This saved me so much time gluing!! Thanks Sheila! I owe you a Starbucks! No maybe not, she's the one that got me sick. LOL! It turned out adorable! I love how you used the bookplates for the tabs. Cute cute cute! Wow! This is fabulous! I love the style! Great idea to use hardware for the tabs. Love, love, love, it! I LOVE this!!! 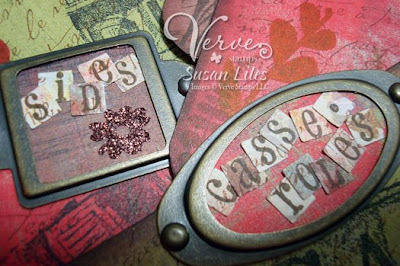 Love the colors, the scrappiness, the IDEA of it...everything! I'm glad you're feeling better! very nice:-) You should do a class -even through the mail. 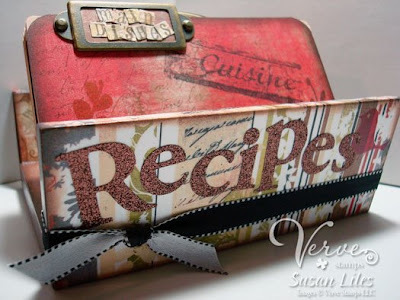 And have it either the recipe or address box--You are very talented. And yours is sooooo beautiful, I love it! This is amazing!!! Love those metal tabs! Who'da thought it? YOU! Glad you're feeling better! Great project Susie! I love the colors you choose.. They are just perfect for a kitchen.. Red is a color that is said to inspire passion in the kitchen.. and we could all use a little passion to cook up something in the kitchen..